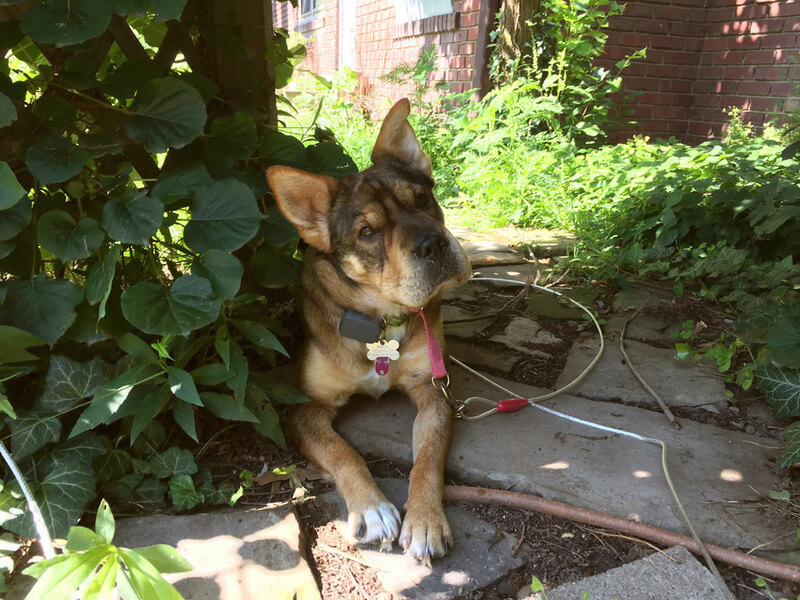 many of you have asked repeatedly about our rescue doggie, Cardigan—how she’s doing, what is she up to, is she happy living indoors, etc.—and realizing that while i take lots of pictures and think about her constantly, i haven’t blogged about her at all since she first came home to us! so i’ve put together an update for today. this took me longer than i thought to write because it was hard to edit down and still say everything. please excuse my running on and on . 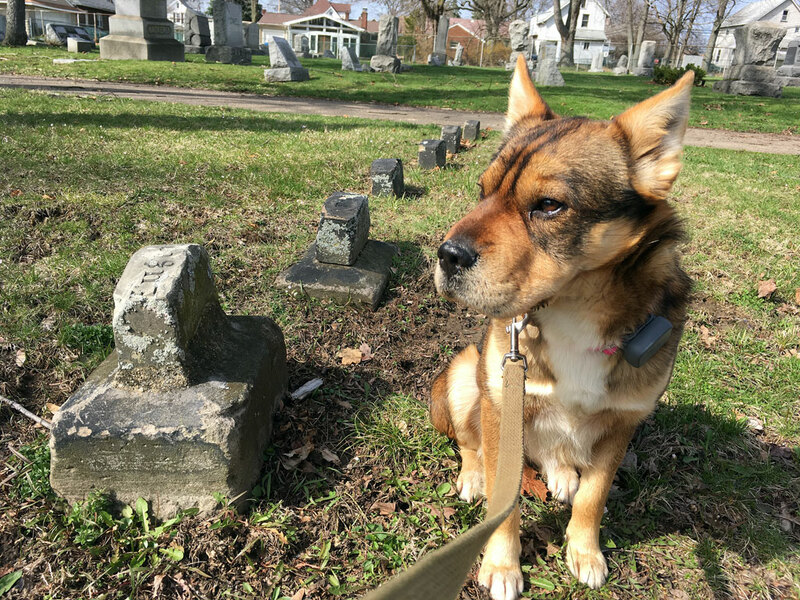 . .
our adoption was finalized on april 6; this is a photo from easter sunday, when we checked out an old cemetery during our walk and after her first bath. 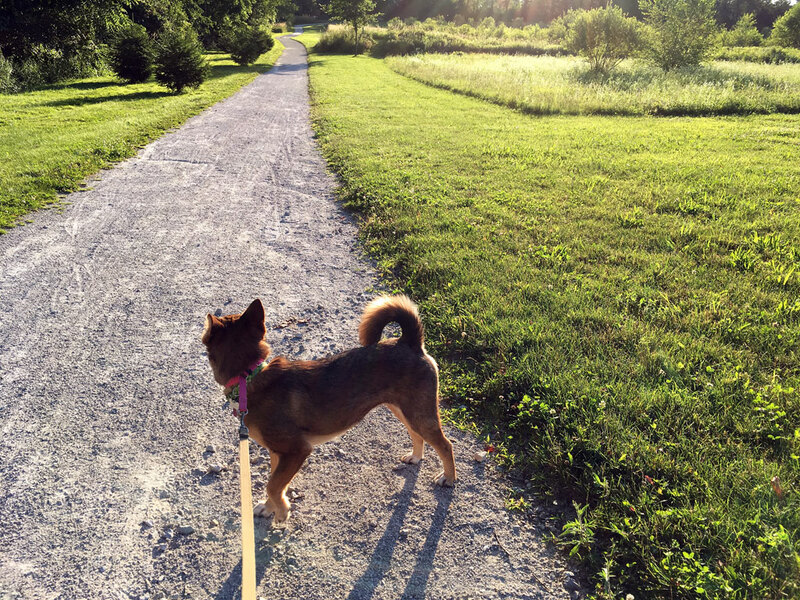 cardigan continues to love taking long, long walks, even on some of the hottest days. for such a little girl, she can walk remarkable number of miles, especially when it’s a bit cooler. This provided a great vehicle for learning each other’s signals and bonding over the delights that our neighborhood has to offer. 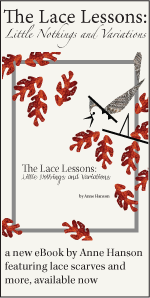 at first, her fears were triggered by the presence of any people or disturbances within a couple of blocks; we’d have to turn and walk in another direction, even for ones i strained to see. each day however, with lots of encouragement and reassurance, she managed to walk closer to people without fear. one day, we walked right by a group of women without a pause and then a few days later a couple of workmen, and soon we were passing by running vehicles as well. soon we were able to walk a whole route without turning away from anything. and after that, she began to be curious and observant of people and happenings. now she stops to watch any activity with interest—kids playing, roofing, landscaping, movers, you name it—i like to explain that she lovees to watch people work. she also enjoys volleyball, tennis and bikes or anything with wheels. you just never know what you’ll find around the corner! Cardigan is famous in our ‘hood and nearby; i can’t get over how many people have read posts about her rescue on Facebook and NextDoor. people i’d never even met came outside to say hello when we walked by and continue to do so—it has been a great way to meet more neighbors and make friends. while Cardigan does not care for cats (they send her into a frenzy of grunts and even bark or two, making it clear we are in the presence of an enemy), our neighbor’s cat patio is a frequent stop; she can visit the cats safely because they are contained inside. at home in the house, things were a bit harder as we began to interact one on one—Cardigan doesn’t bark or whine for her needs (common for the shar pei breed, i’ve read) and her signals are very subtle. to complicate things further, the feral dog’s terror of humans made her fearful of direct interaction, especially touch. while she followed me around everywhere to watch, she did NOT want to be touched. we tried making a crate for her as a safe spot, but she avoided that like the plague; probably too much like the trap she’d experienced. far under the table was her favorite spot and in those first days i often got right in there to sit alongside, sometimes knitting on deadline projects so as not to get more behind on work (later i would measure her progress by how much of her body length she allowed out from under the table). it seemed she just wanted me to “know” what she needed and sort of throw it to her, so there was a lot of trial and error. one thing was clear—we were going to take things very slowly. our first couple of weeks we mostly observed each other and tried to communicate from across the divide. she was house trained in a couple of days (also common for shar peis), for which we could give her lavish praise and build from there. i read that i was supposed to use treats to train her; i knew of just a couple of things she liked to eat—hotdogs and peanut butter—and the hot dogs she would not touch any more (and still won’t—who can blame her, really?). 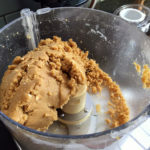 so while she watched from under the table (her safe spot during those first weeks) i gathered peanut butter, sweet potatoes, oats, and flour to bake them. i used GF flour so i could taste them—i love PB cookies and i was curious, haha. 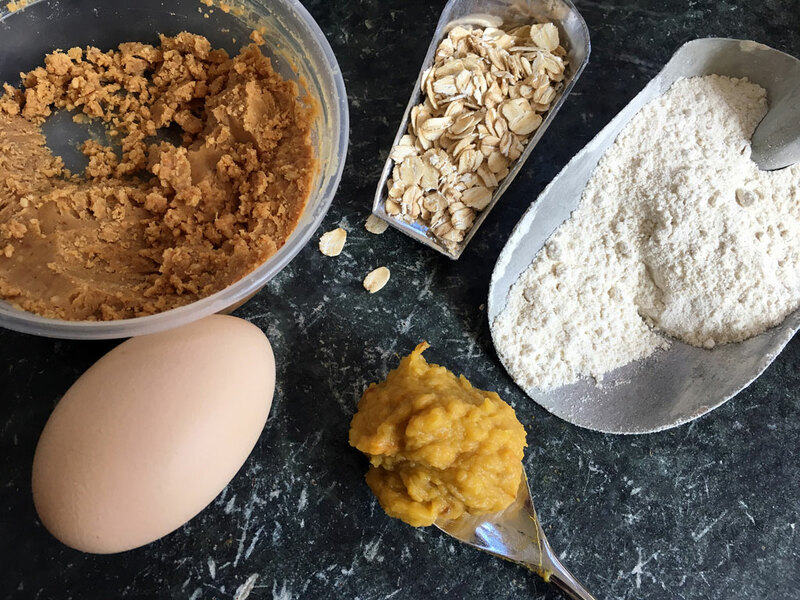 process oats to break down a bit and add all other ingredients; process to combine, adjust as desired to form a soft dough. 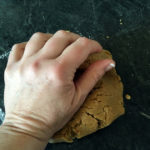 knead a bit til smooth and roll to a 1/4 to 1/2 inch thickness. 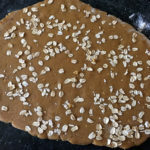 sprinkle oats on top and press in with a rolling pin. 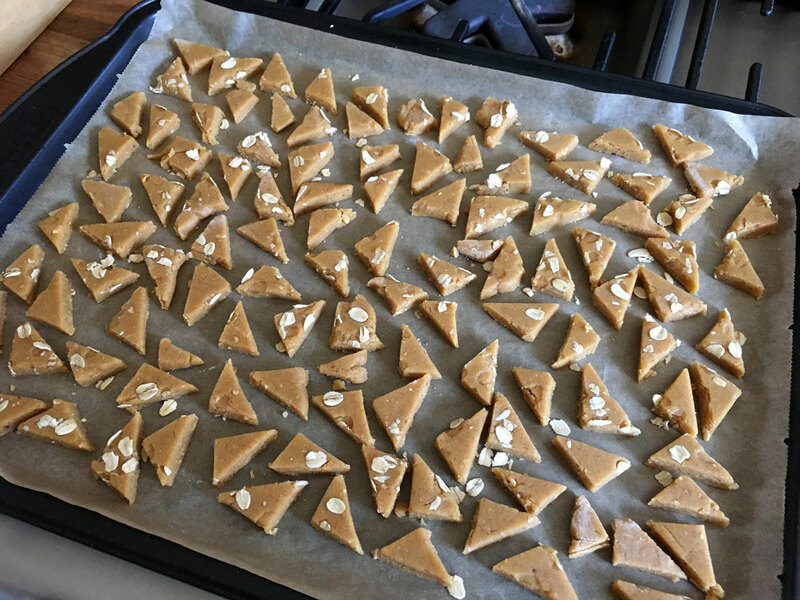 cut into bite-sized shapes and bake at 325 degrees to just a bit less than desired crispness (about 8 mins in my oven). if i had a tiny bone-shaped cutter i’d use it but i don’t. 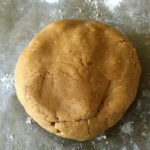 and the taste was pretty good; a little more bland than a human cooky but plenty peanut buttery. i didn’t realize it then, but Cardigan isn’t very food motivated. i mean, almost not at all, haha. she does like a cooky now and then and knows that ellen and lillian keep them at the office, but she wasn’t going to magically come when called or accept touch/affection because a treat was offered. that would be a long time coming and we’d have to earn it the hard way! and by the way, we still have a few of these treats in our jar—they last forever. she also had (and continues to have) no concept of toys or playing with humans and at first did not engage with other dogs. in fact, she has a concerted aversion to most toys. the chicken that i thought was hilarious is not a hit. that monkey she resting on in the first photo? it lived in her bed at the shop for a while, but got a vigorous boot out each time she’d settle in. ellen finds this hilarious; we have since replaced it. 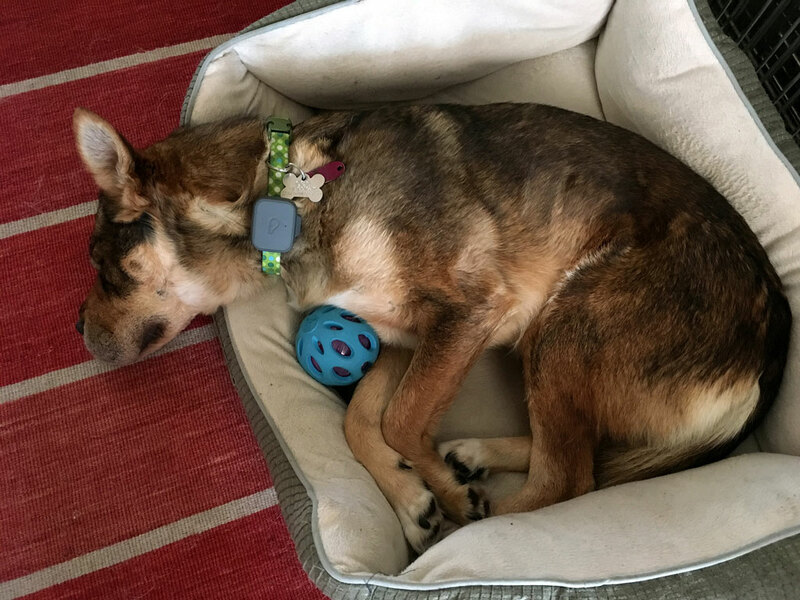 we can roll a ball or throw a squeaky toy her way and she’ll look at it as if to say “OH, so that’s where you wanted that to be put” and lie back down, satisfied. the kong toys that everyone suggested are not of interest—we bought one, filled it with her favorite tasty bits and it sat untouched on the floor for days. when i picked it up to show it to her, she acted like i was about to hit her with it. i felt so bad, i just wanted to get rid of it, fast. 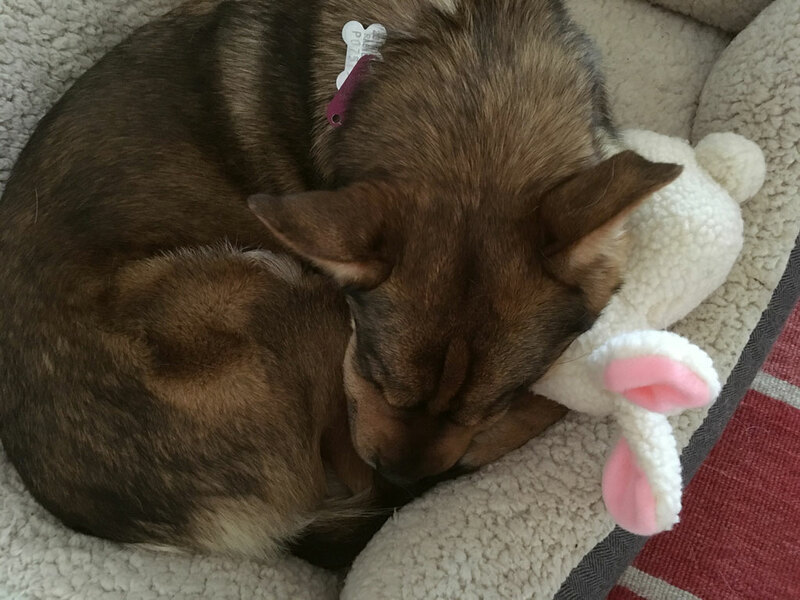 so using toys was also not going to work as a training reward, though she did finally accept this soft fleece bunny for a sleeping companion. what actually works best with this little girl is verbal praise—she just loves getting a good girl! and responds almost instantly with more of the same behavior or even some new trick that goes a little further. this works for me—i vastly prefer a strategy that i can take anywhere and produce instantly; no fumbling with baggies of treats or ending up without one when i need it. and it’s probably healthier to save treats for special occasions. while we kept her strictly at home for the first few weeks to get adjusted to us and our routines, i also wanted her to consider the office an extension of our home, since we spend a decent amount of time there every week. so during our second week i started bringing her to “work” to acquaint with with our small team. the first day was rough—she paced and shook herself constantly and i took her back to the house after a short while. but the second time she settled in right away and observed quietly. 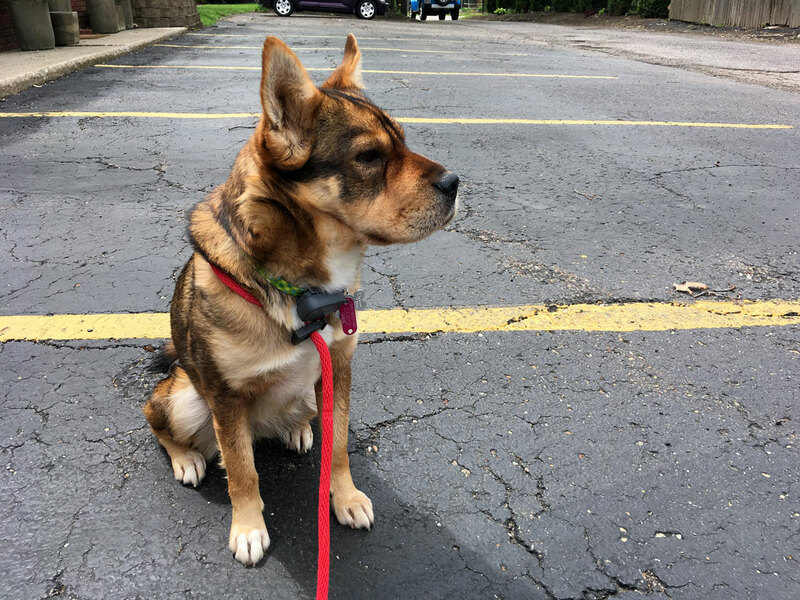 since then, it’s become on of her regular “places”—localities she needs to check on every other day or so and she heads to the shop door enthusiastically whenever we go out the front door (back door is for most other walks). lillian, ellen, doug, and hannah are so kind to her; they are all rooting for cardigan to be a success story and each is hoping to be the next one allowed to pet her. i soon figured out that our most urgent task was to work on socialization—Cardigan was in robust health when we got her, with no parasites or other issues; she also had excellent eating habits, slept well, and shows no aggression to people or other dogs. in fact, she was very polite and considerate from day one. 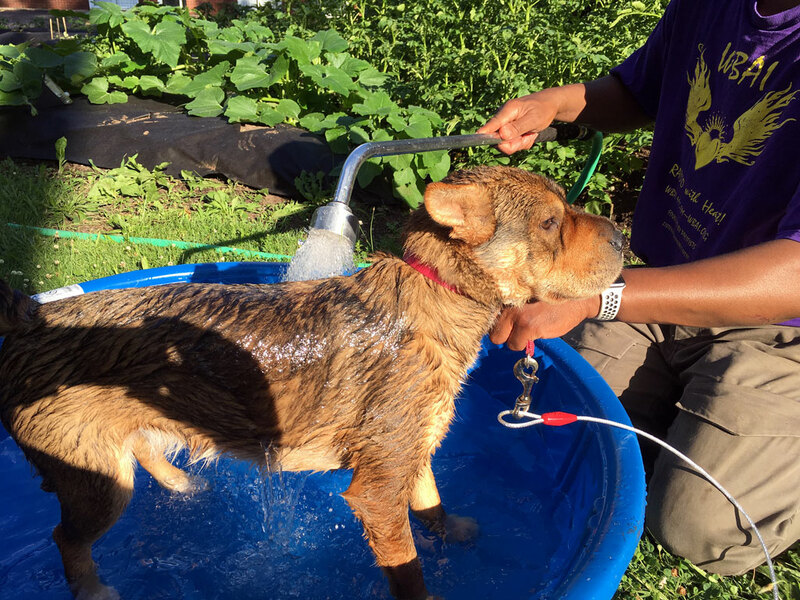 but being a loner, cringing from all touch, or not coming when called were problematic—we needed to be able to put a leash on, check for ticks, and keep her safe from danger. 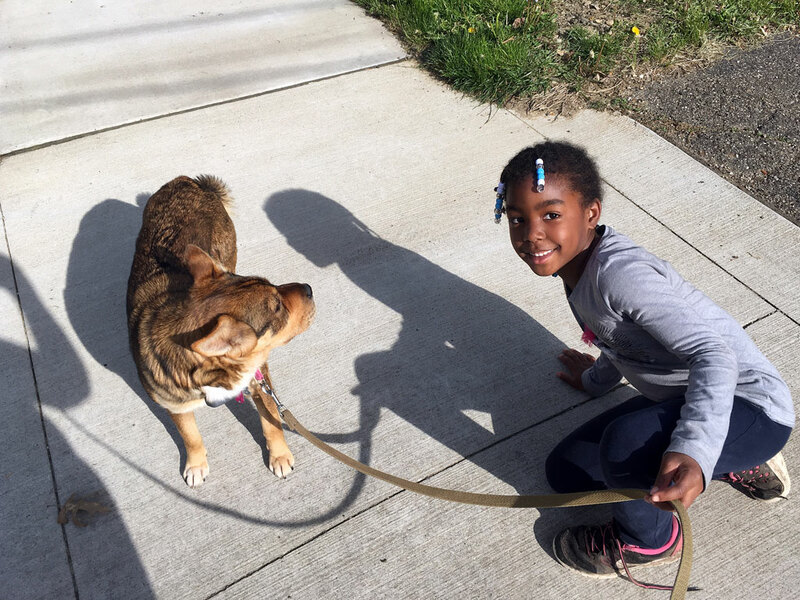 during our walks she was constantly approached by kids and neighbors wanting to pet—and while not aggressive at all, she needed to gain some tolerance for people. we also knew that within a month of her adoption, david and i had to leave town for maryland and that she wouldn’t be able to go. she was going to have to be kenneled, so we had to get her as ready as possible. i really didn’t know where to begin, but i got some guidance from our friend ramona and from barb and i read as much as i could about feral dogs and positive training. every day i did a few sessions of touching with Cardigan, starting with hand feeding, then a bit of rubbing around the head and ears, etc. we made a ritual of bedtime by putting on lavender oil and calming her with our hands and after a couple of weeks, i noticed that she was submitting willingly and even jumping into bed on her own to receive a cuddle. for the next week, i worked my way along her back, noticing at what point she became tense, so i could stop—a little bit more every day, not too much at once. then one day she turned over and showed me her belly—i nearly cried, i was so happy, haha. it still took many weeks to be able to pick her up or handle her whole body, legs, and feet; in fact feet are still mostly off limits for grooming (luckily, her city walking habit keeps her nails at just the right length). since she was now also ready to have access to the whole house, i think that freedom felt like a big reward for her taking a big risk. she allowed me next to begin brushing and combing, which was a completely foreign experience, judging from her reaction. i was anxious to introduce this as a way for us to spend time close together. the walking was fantastic for becoming friends, but allowed her to keep an impersonal distance and she still cringed when we reached for her, preferring to be the one to choose touch (which is never). i wanted her to come close for comforting and affection and trust us to handle her safely. i believe that’s important to fully enjoy life . . .
this was exhausting work—but there were many moments that kept us enthused about her progress. one day while standing at the sink, she ran lightly over and touched my hand quickly with her nose, then backed off and sat down expectantly—she was asking for something! i had no idea what, but i made a big deal out of it anyway and over the next few days i got more pokes on the back of my leg and little grunts too. i’m still not sure what these mean exactly, but she produces them only at certain times and it’s definitely some kind of communication. 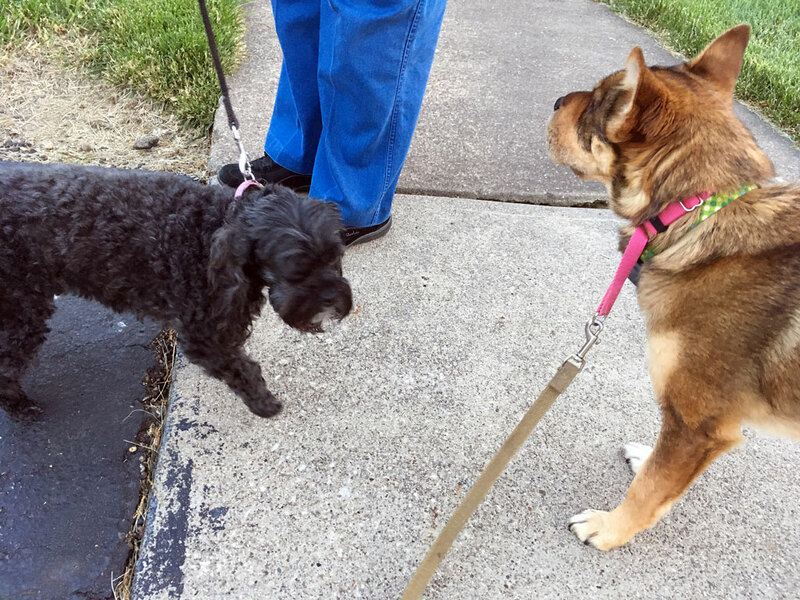 as Cardigan made progress in our interactions, she also began to open up more on our walks. this is her friend liberty, who lives on our street and adores Cardigan. she’s been diligently working on approaching the dog and is slowly gaining her trust. as you can imagine, children can be the most frightening of humans for a dog and Cardigan is not a fan of every kid on the block. but liberty is special and they are now friends. after about four weeks, when cardigan had settled into a some routines and made good progress, i could tell that people meeting was still a huge hurdle for her. she was having trouble getting started, even with us in some areas; her walks were serious affairs, more obsessive than fun and playful. so i mixed up some bach flower remedies—as recommended by a few readers and started adding the drops to her food. i started with one to address cowering in fear and disassociation; this seemed to support the other efforts i was making so i added one for socialization and enjoyment of life. 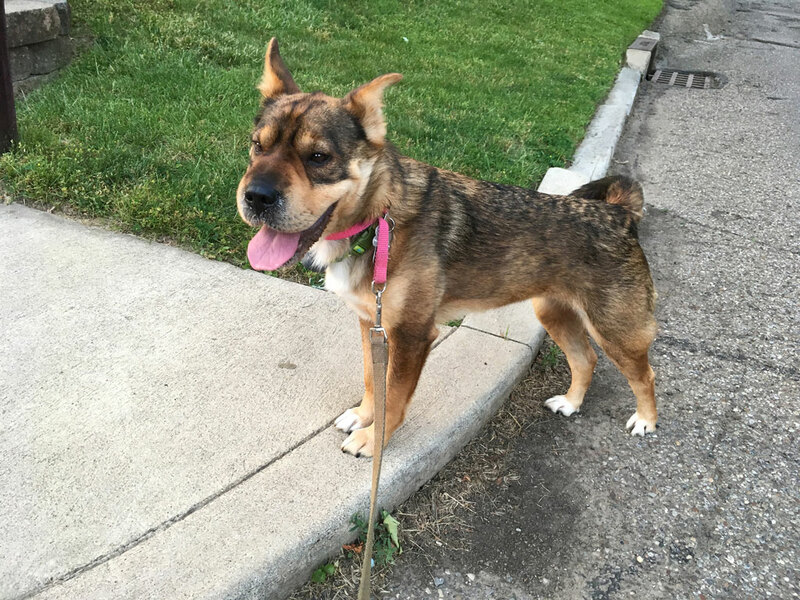 in a couple of weeks i noticed some changes; she was coming out of her shell more, relaxing more around the house and making tentative advances to other dogs during our walks. soon she was showing actual excitement when another dog was sighted and even crossed the street to meet them. these were big breakthroughs and my heart swelled to watch them unfold, especially when she began approaching people as well. not to be touched yet, but to investigate; we are still working daily on allowing others to pet. the kennel experience over maryland weekend—including her first ride in the car—went as well as could be expected. 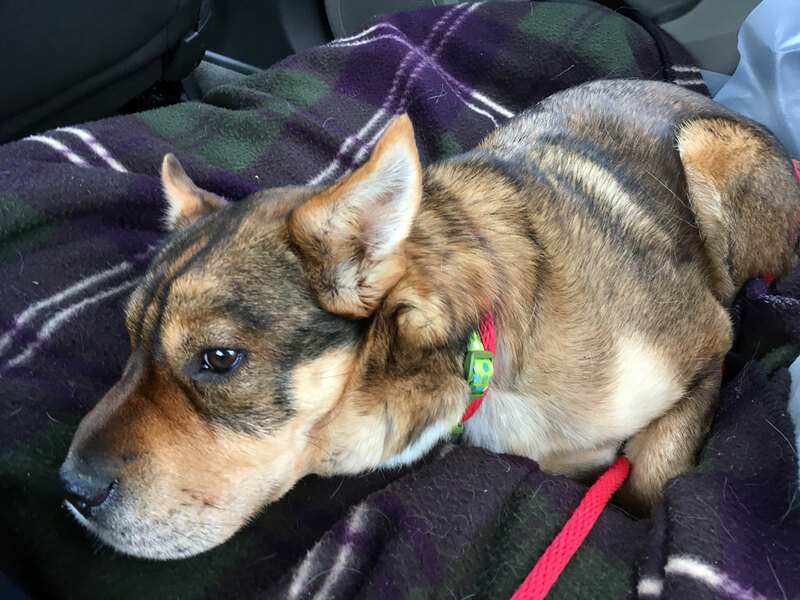 while not ideal, it did not seem to cause a setback and on the positive side, she was beyond ecstatic to see us afterward and is now very comfortable taking car rides. we all felt better about it after it was over, though i hope we don’t have to do it often; she loves being home with us! 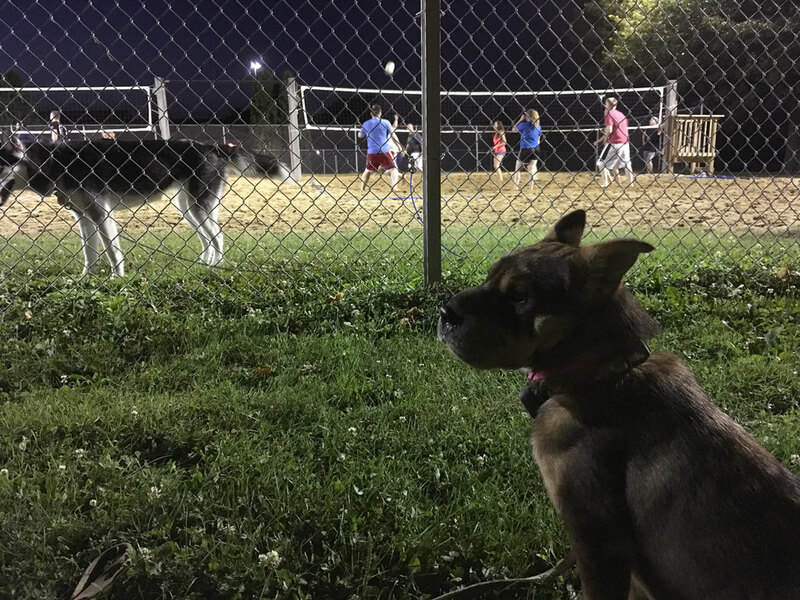 she progressed nicely through may, opening up more and more to people and beginning to initiate games with other doggies; she was particularly inventive coming up with games she could play on a leash. 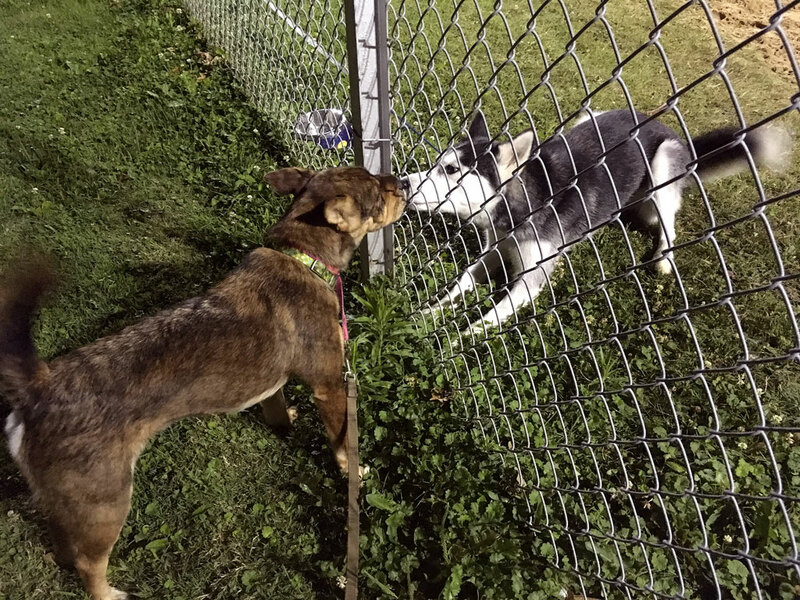 i began to think about taking her to a dog park so she could socialize freely. then, just as we were getting ready for the wooster show, she slipped out the door as david was packing the truck. she had been nervous for a day or so as the shop was buzzing with preparations and when she saw the booth fittings coming up from the basement, she must have gotten the idea she was going back to the kennel (even tho it wasn’t so). we chased her frantically in the car, but she is fast and she just ran, looking back at us the whole time to make sure she had us in tow. 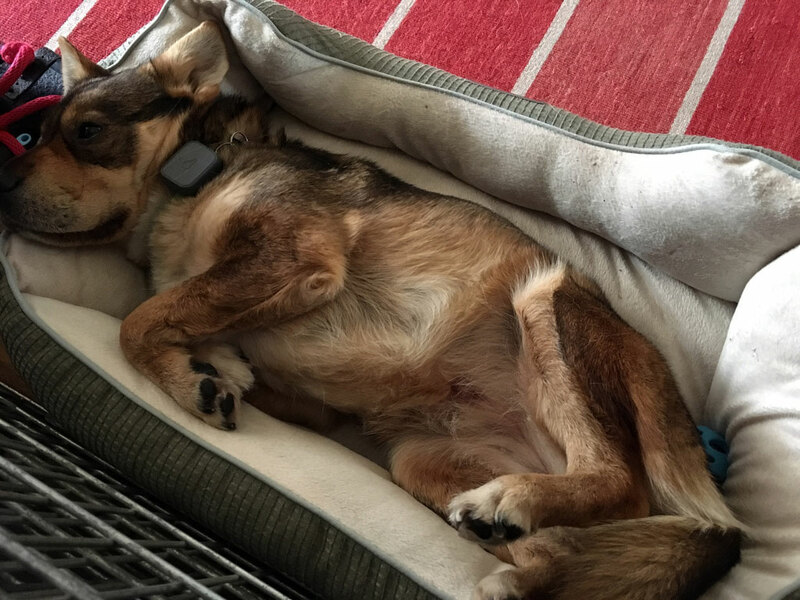 she has a GPS tracker on her collar which connects with our phones, but the day was rainy and dark and the battery wore down quickly. soon, we lost her and she stayed away for EIGHT DAYS. needless to say i was beside myself, our searching on foot for hours every day; our friend ramona of jj’s ruff roads once again stepped in to help us track her and this was a comforting support; i felt SO dumb, ugh. we stapled up posters, put listings on all the lost pet websites, and asked countless people to keep an eye out for her. thanks to her fame around the neighborhood and having met so many friends over the weeks, she was recognized by many and we had lots of sightings reported—all quite close to home. but she was on a big joyride for the first five days and continued running, even from us when we saw her. but it seemed she was circling closer to home each day, maybe winding down? by the seventh day she was seen sniffing around our yard at night; we just couldn’t catch her. ramona and i were ready to set a trap and the next day we laid out food bowls along 15th street as bait to our property. as we were doing this, ramona spotted Cardigan trotting along the the tree line across the avenue, heading right to us! she ran into an entryway at the back of a small office building there and when we rounded the corner, she ran right into my arms. 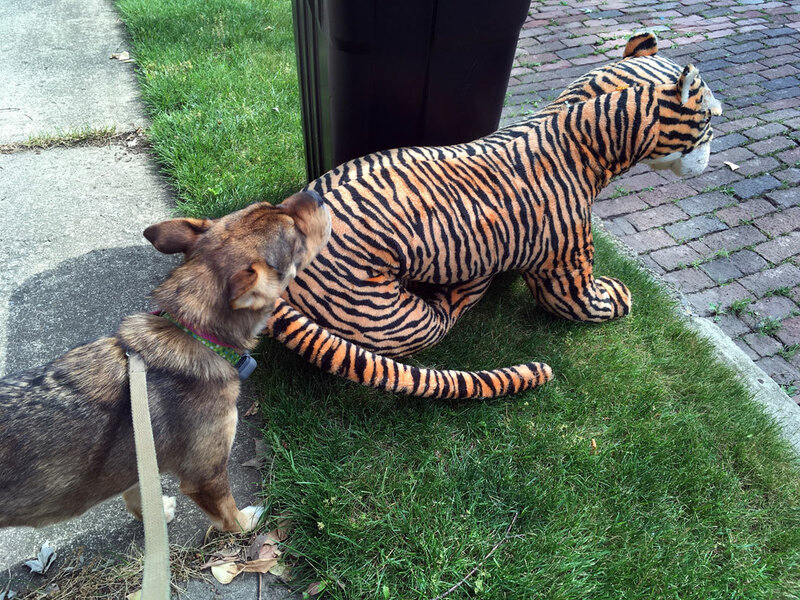 our friend kodah was on hand to welcome her back to the land of the safe and tame. tired, dirty, and a bit thin with hair falling out in handfuls, Cardigan was stuck to me like glue for the next few days. while this was indeed a setback—i was pretty shaken to think that the firm bond we’d established could be tossed aside so easily—there have been some obvious changes since in our relationship. first, she was not just glad to be home and out of danger (she was visibly very shaken, actually), but has since shown us each day that she is super happy to be living with us. she actually smiles a LOT now. our verbal and nonverbal communication is even more in tune than before and our bond is stronger, if anything. i have a whole new respect for the intensity of feeling one can develop for a dog—i seriously never thought i’d have a pet nor were we looking for one. but i knew would lose it if she didn’t come home, even as everyone around me assured me she would. i was scared while she was away. Cardigan now readily comes when i call her—HUGE breakthrough!! she also comes around looking for affection and waggles her head to indicate i should rub her face and neck. when we eat dinner, she joins us in the room and afterward, leads me to her bed to be tucked in for the night (still doing the bedtime brushing and lavender, now with toothbrushing added!). when i’ve been out of the house for only an hour or two, she comes galloping toward me full speed, sliding into a doggie dance at my feet, as if we haven’t seen each other in ages; she makes me laugh out loud, hug her tight, and babble in baby talk. if only you could see me. and i don’t know how this is related, but she is ten times more friendly with other dogs and people now. she makes a decided effort to approach people as closely as she dares and increasingly allows petting, though randomly. with dogs she is always ready to play and we rarely meet one that doesn’t like her. and we meet LOTS of dogs in our neighborhood on our walks. we are walking these days for jj’s ruff roads, using the walk for a dog phone app, helping to raise money for another dog’s rescue and rehab. 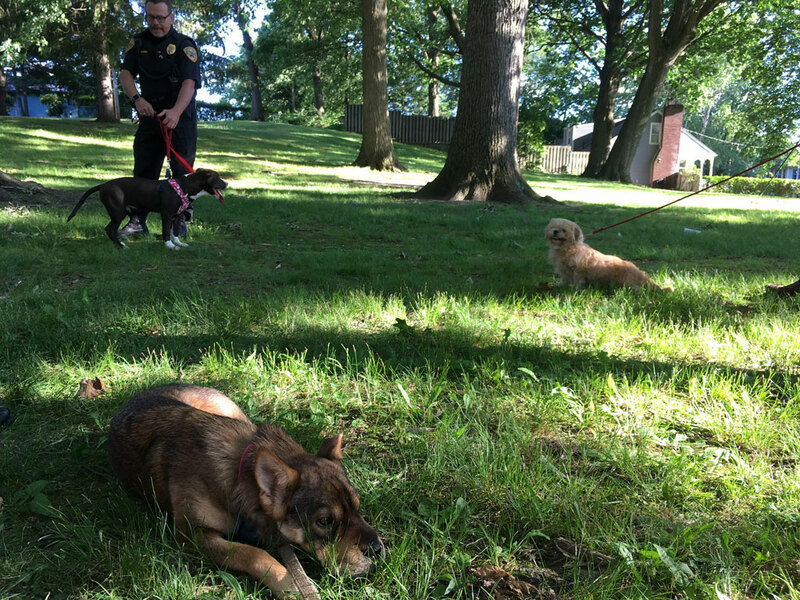 ramona is always working on a new case; pinto is a recent example of rescuing a nearly lost cause. and anyone can participate; you don’t need to actually be walking a dog. you can borrow cardigan if you like or name a doggie friend. just click the app at the start of your walk or bike ride and it willl count. i recommend jj’s ruff roads of course but you can choose from a long list of shelters when you set it up on your phone. 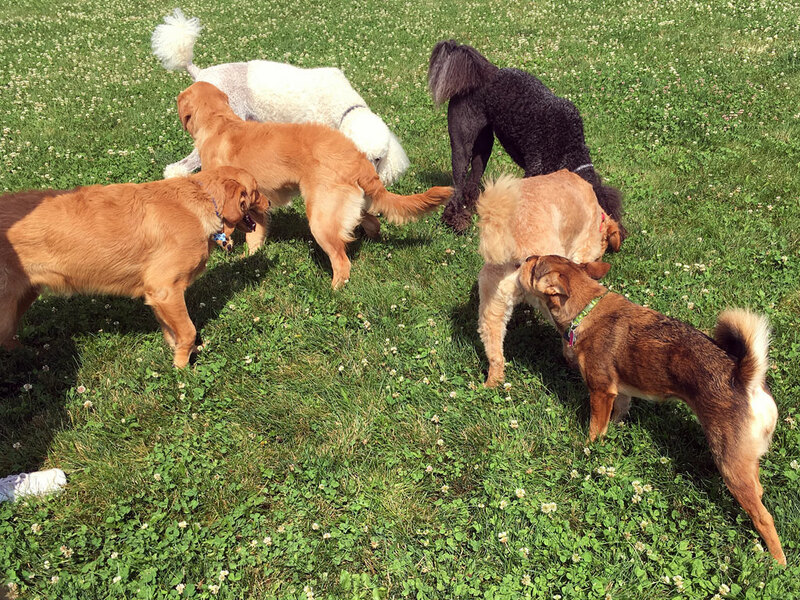 on the fourth of july, barb and i took our gang to the dog park to try that out. Cardigan was in her element—right away she ran HUGE circles as fast as she could, but always came back to me for a checkin (heart melting, right?). she likes to horse around with bigger dogs that are fast and strong. 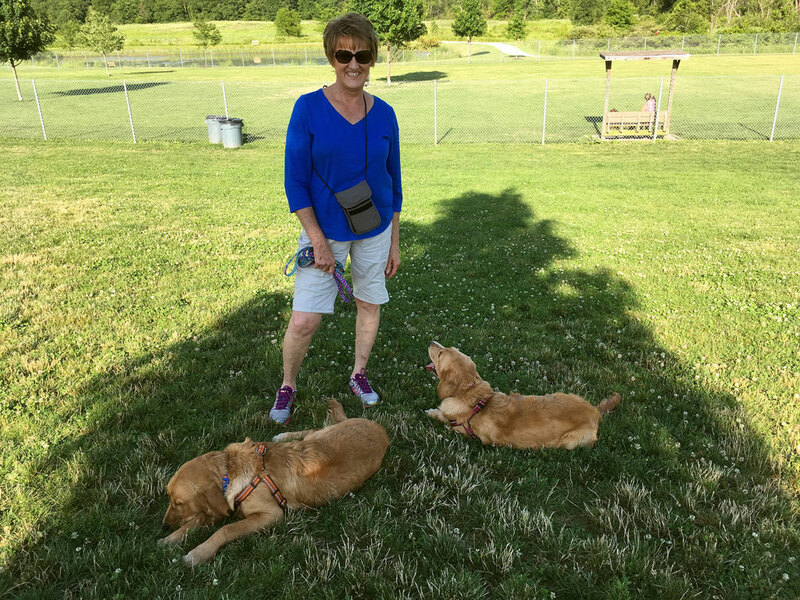 barb is trying to get her two puppies to socialize with others and take part in separate activities—important lessons for siblings. here Cardigan tries to engage gracie in her favorite game—”come sniff me so i can pounce on you” (remarkable how many times she can get a single dog to do it). when gracie doesn’t respond, Cardigan goes over to entice her into a game of keep away. 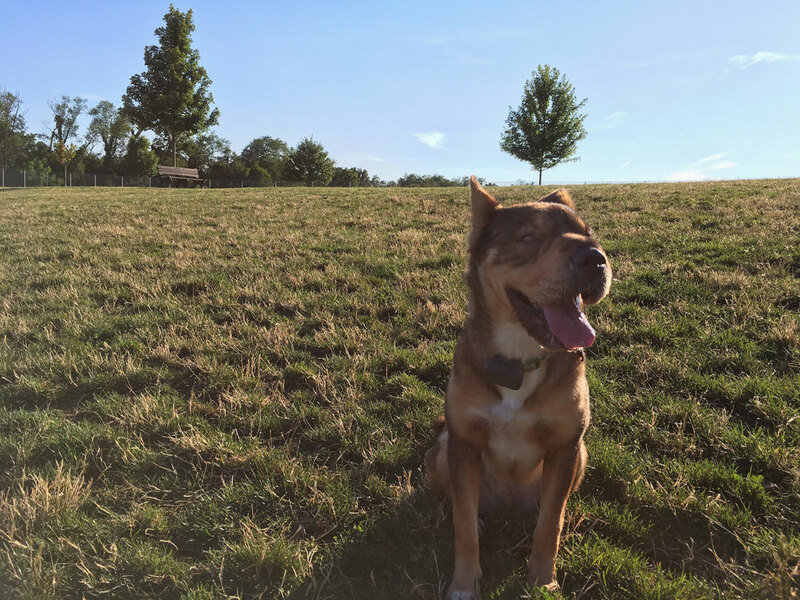 when i look at the photo and then look back to the post i wrote after her rescue, i see a different dog, one that is happy and confident and full of joy. this is what i’ve dreamed for our dog, that she might have a life with carefree hours and beautiful places to visit. that beyond having the shelter of a reliable home, she would come to enjoy and look forward to us as companions and friends. or make her share her bed (unfortunately, not a mohair goat, but a good pal nevertheless). i think she thinks she’s got a pretty good life now and will stick with us, mistakes and all. I’m so thrilled to see this wonderful post! Thanks so much for taking the time and effort to share Cardigan’s journey with us. She’s come such a long way. I too would have been sick with worry when she ran off again, but it seemed to have taught her to be thankful for her new life in a way. Give her a big hug from me. I took in a dog from the streets back in the early ’90s but he wasn’t feral, just neglected. How wonderful that you made the intense effort necessary to socialize Cardigan. You and David and Ramona ought to pat yourselves on the back big time! 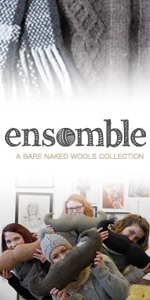 Go Knitspot! So glad that it has gone well. We have two rescue cats. One of them took four years (!) Before she felt safe sitting on my lap, and she is stll not so sure about it. Cardigan will never be able to tell you about childhood traumas, but she is clearly home. Thanks for the update! Good post. And good girl! You called this ‘infatuation’ but it sounds like unconditional love (on both sides!) to me. Wonderful to read, thank you. Thank you for the update. I can’t help but think that Cardigan was testing herself and you when she ran off and had her big adventure–she obviously found out that life with you and David was much better than the life she remembered on the street. What an amazing turning point in her life with you. Thank you for sharing Cardigan’s story. My first dog was a rescued senior (10 years old) who had been abandoned by her family. The first time I left her at the kennel she looked at me with her head hanging down believing she had been abandoned, again. When I picked her up she was overjoyed and she knew that I would always come back. I think that Cardigan now knows that you will always look after her. You’re her human now ;). Your dedication to Cardigan is so sweet and special. having a pet is just like having a child. It is the most joyful and heartbreaking thing at the same time. I hope your experience with Cardigan continues to be wonderful for all of you. Thanks for sharing. 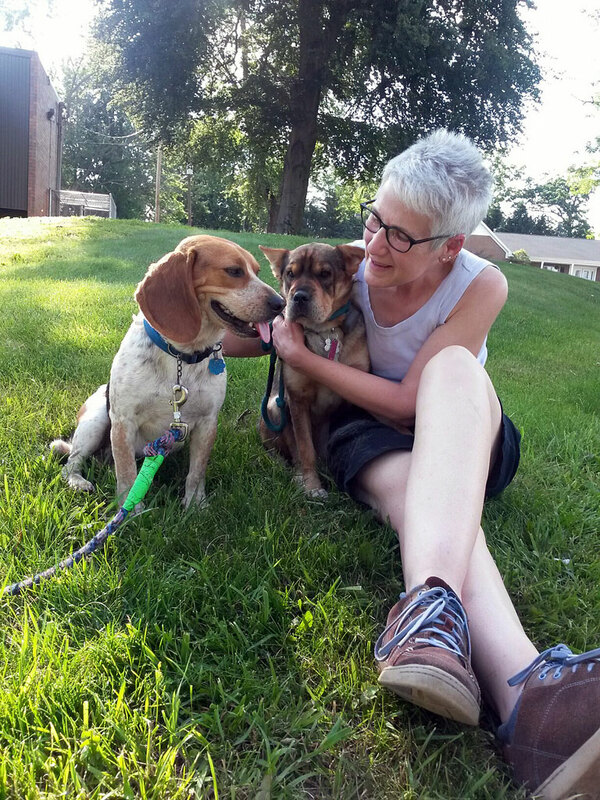 Cardigan has clearly found the right family for her and you have found yours! What a heartwarming post. I can’t imagine the stress of losing her for 8 days (actually I can!). It’s such a desperate feeling. What joy that she returned, and seemed to realize that life with you was better than that on the streets. Our pets enrich our lives so, and make us better humans. Thank you for the Cardigan update. It is such a happy story. Yayy! Love the update, love seeing that face. She sounds like she’s doing amazing! Oh my goodness, she has the sweetest face! Clearly she found the right people, and you found the right dog. Hugs and scritches to all of you! I love this post; and am very happy things are working out so well! 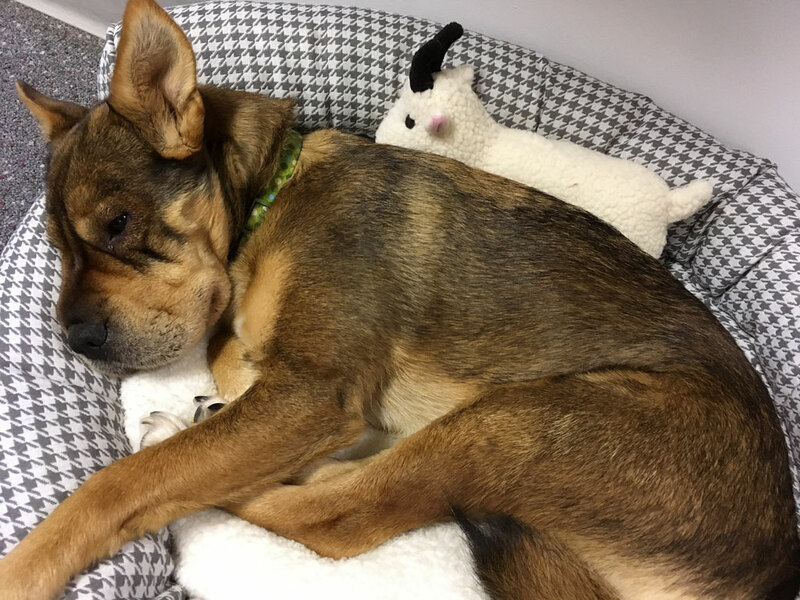 Thanks, Anne for this wonderful post…..I’ve been waiting to hear how Cardigan is doing….what a wonderful story that you and David could save this great little dog’s life….and to make it a GOOD life!! Lovely post, Ann. Thank you for sharing. Taking in ferals can be so rewarding when they begin accepting you as their family (our experience with feral cats). Trust begets trust, and then you know that they won’t leave you – wonderful feeling. Absolutely loved this Cardigan update! How super to know that your hard work has paid off as she has been able to show her trust in you and share affection with you! My heart dropped when you said she escaped, but I also figured there had to be a happy ending. Thank you for sharing Cardigan’s work in progress! She looks like a very confident girl. Oh poor Cardigan… she must have been so scared when she ran off! Some dogs go into a panic mode, the flight response takes over and, it’s not that they don’t want to come home, they’re just so confused and scared; and with a people-shy dog like Cardigan they might find themselves totally lost… even in their own “neighborhood”. I am very glad the story had a happy ending. And that the fright helped her bond closer to her safe place and people. She’s a lucky, lucky dog. And you two are her lucky family. What a touching story of devotion. Cardigan is so fortunate to have you. Thank you Anne for keeping us updated on Cardigan’s new life with you and David! You both are such good doggie parents. 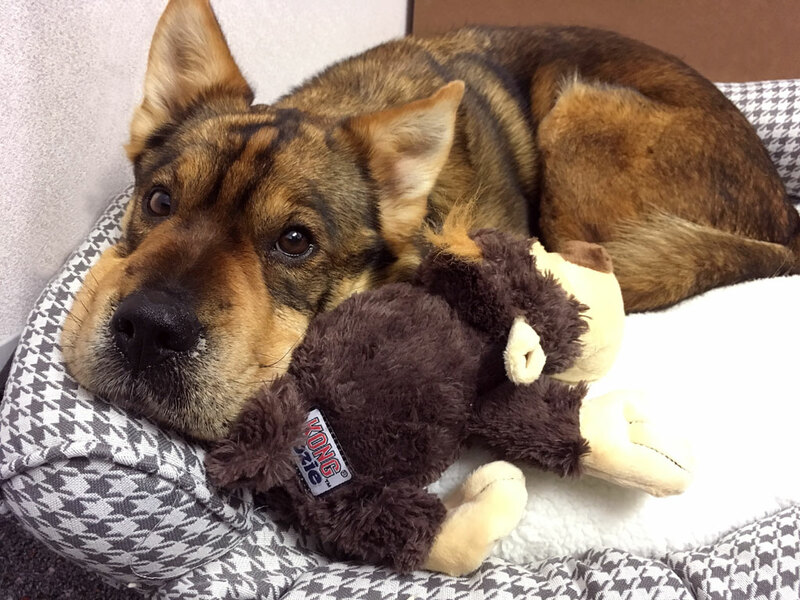 Keep doing what you’re doing….. and, more pet posts please! 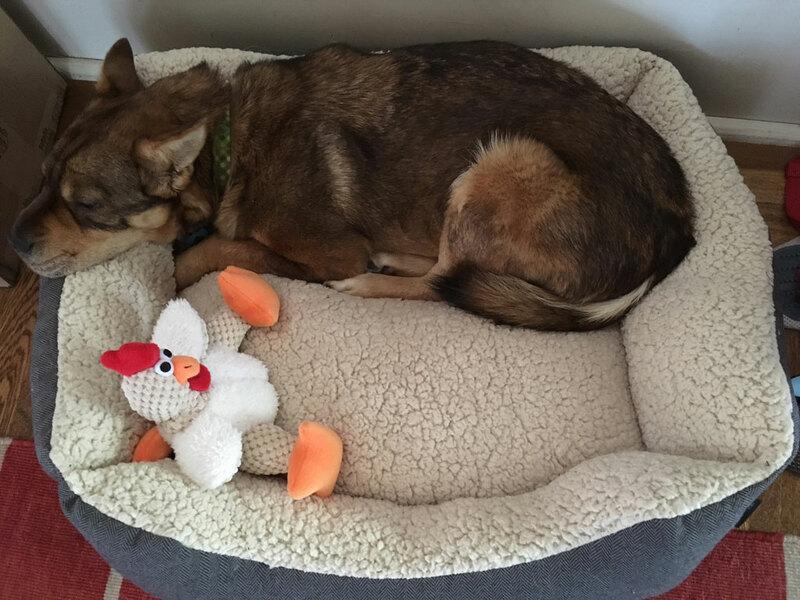 So good to get an update and see how happy Cardigan seems now…I think we’re all sending virtual pats, which should be easy for her to accept! What a great post! So glad Cardigan is doing well. Hi Anne. I rarely comment on your posts, and I enjoy them all so much, but I had to comment on this one. I enjoyed this update on Cardigan so much. My heart sank when you said she slipped out the door. I am so relieved you got her back home! Describing yourself as speaking baby talk to her made me laugh. It’s so natural and almost involuntary, isn’t it? I love when I catch my husband talking baby talk to our cat. 😉 I’m so happy for you all. Wonderful post! You have been so busy with Cardigan. So glad that you are enjoying your new pet; they provide such joy in our lives. Thanks for sharing everything with us! “Wild thing, you make my heart sing!” I am so glad you were reunited. Enjoy the continuing adventure with the lovely Cardigan! I am glad she is doing well. In your first posts of her she looked a lot bigger. I guess it was just the angle of the camera:-) She is a very cute puppy. What a lovely heart-warming story! I’m so glad you found each other. I was so happy to read your update, thanks for sharing this. My Lily isn’t feral but she is a rescue dog, and I found myself nodding along to a lot of the behaviours you describe. She will still often stand under our table when she’s feeling uncertain about things. She has come a long way in 4 years and now loves us, tolerates petting (she will never love it), and actively seeks us out to play (her form of affection). She’s still not keen on other humans, but she quietly tolerates them. Every so often, she retreats into fearful behaviour and sometimes we don’t know what triggered it. Lots of gentle communication sets her back on track. By the way, she also does the nose touches on my legs and I have interpreted this to mean, “I love you” or “I love what we’re doing”, or “I’m just checking in” – all depending on the situation! Cardigan is a really smart dog. Her taking off did a couple of things. Made her realize it wasn’t so great out there and you still were there for her. She now knows which side of her bread the butter is on. I applaud your persistence and patience. My son adopted a cat from his local shelter that was a stray (not feral) and had been at the shelter for nearly 9 months. After many years of gradually building trust, she FINALLY decided to become a lap cat for both snuggling and shelter. It only took five years. Thanks for the update with lots of photos. I shed a few tears over your family bonding and the wonderful life you have given to Cardigan. 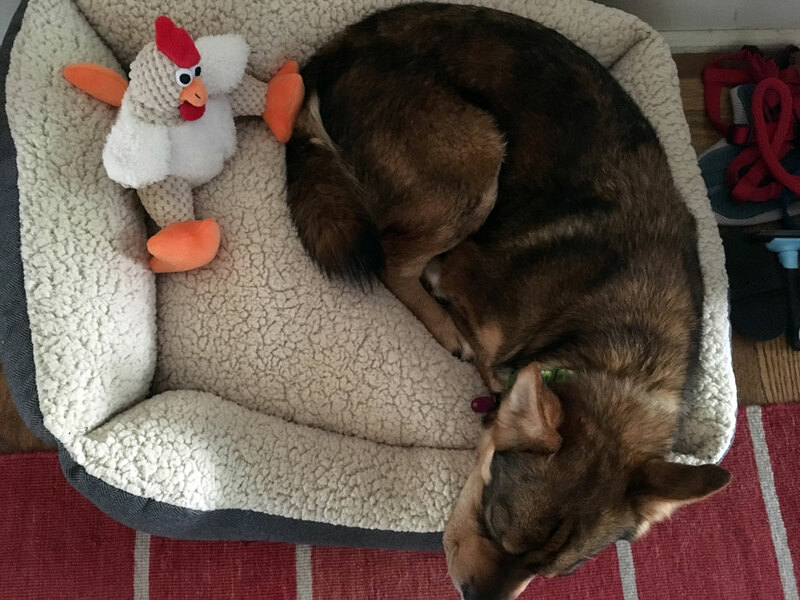 Thank you so much, Anne, for sharing Cardigan’s story and, actually, for adopting her! 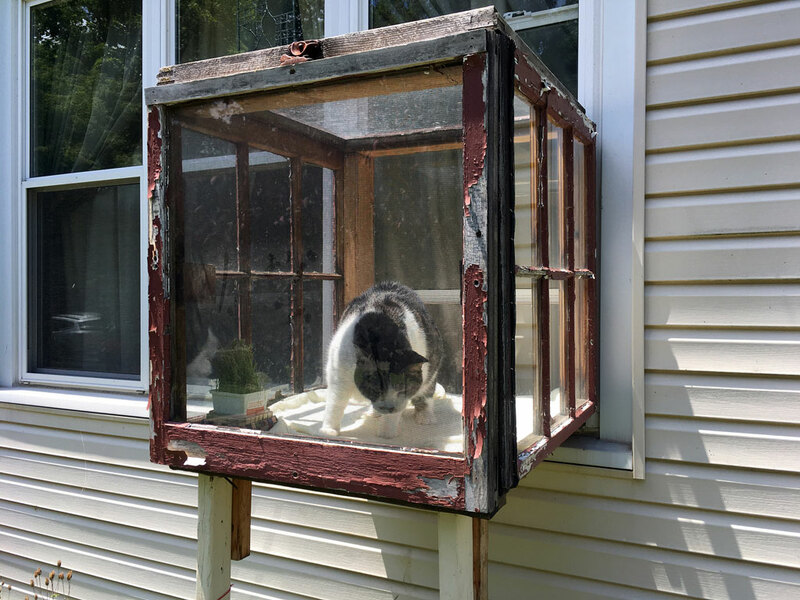 My cat Harley was a feral – living in a colony in an apartment complex parking lot. The cats there were fed by several people, including one of my friends, and Harley was the ‘friendliest.’ I’ve had her for 15 years – she was probably about 2 when my friend caught her for me – and she will never be a lap cat, but I know she loves me. And I am sure that she remembers something about her old life, as she has absolutely no desire to go outside! What a beautiful story. As my grandmother would have said, “there’ll be stars in your crown in heaven” for working so hard to give Cardigan a loving home. Please keep updating us on her story! Cardigan has the sweetest little face I have ever seen. We had a lovely little Weimaraner rescue who had been found on the highway with a crushed leg and when we adopted her she had just had that leg amputated. She lived 14 years with three legs and even could run–although certainly not too far. She loved her walks, but other than that did not want to be outdoors. Seemed to think she had enough of that before we adopted her. It’s so nice to see you so smitten! !